Unparalleled threat protection — The #1-rated antimalware solution for web threats, McAfee Web Gateway analyzes the nature and intent of all content and code entering the network from requested web pages, providing immediate protection against malware and other hidden threats. With layered security that combines local and cloud-based protection, powered by McAfee Global Threat Intelligence, you can count on Web Gateway for instant, advanced protection to stop zero-day threats, spyware, and targeted attacks — without a signature. Learn more about Web Gatewa's latest threat protection enhancements that provide state-of-the-art behavior-based emulation and detection techniques. Web identity management — Web Gateway includes optional single sign-on (SSO) connectors for more than 500 popular SaaS applications. Use SSO to improve end-user convenience, enhance security, and reduce expensive password-related help desk calls. Easy, efficient management — With Web Gateway, you can stop deploying and managing multiple standalone web products. Web Gateway integrates numerous protections, from web filtering and anti-malware to SSL scanning and content control, all with a simplified management footprint and a flexible policy engine. Share a single security policy across protections and protocols, and meet the needs of your entire organization, enhancing protection while saving time and money. Agile infrastructure and performance — Web Gateway includes high-performance, enterprise-strength forward and reverse proxy software that provides the flexible authentication, administration, and authorization controls required by today’s most demanding enterprises and service providers. Numerous deployment options — including purpose-built appliances or blades, a virtualized platform, or integration with cloud-based McAfee SaaS Web Protection — ensure Web Gateway scales to meet the needs of your unique enterprise. Organizations can do more over the web today than ever before. Today’s web offers a dynamic, real-time user experience. Static information has given way to social networking sites, blogs, wikis, RSS feeds, interactive applications, and user-generated content. Enterprises are taking advantage of these innovative capabilities to do business in more efficient, collaborative ways. However, the web has also become a more dangerous place, with increasingly sophisticated attacks released every day. The McAfee® Web Gateway appliance, our on-premises web security solution, is the first line of defense for any organization to protect against evolving malware threats. 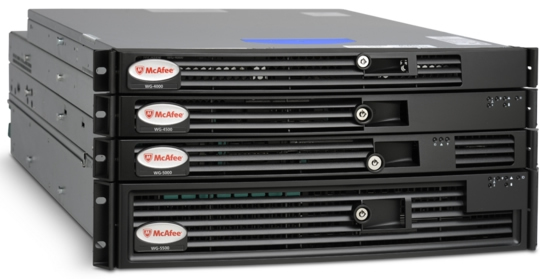 The next-generation McAfee Web Gateway appliance empowers organizations to enable employee access while greatly reducing an organization’s risk with an advanced security approach that combines powerful, local intent analysis with cloud-based protection powered by McAfee Labs. Use proactive intent analysis to filter out malicious content from web traffic in real time. By scanning a web page’s active content, emulating and understanding its behavior, and predicting its intent, McAfee Web Gateway proactively protects against zero-day and targeted attacks. Outbound malware detection identifies and isolates existing infections phoning home, and prevents sensitive data from leaving the organization through Web 2.0 sites. Web Gateway combines local protection from McAfee Gateway Anti-Malware Engine, its powerful, proactive intent analysis, with cloud-based McAfee Global Threat Intelligence (GTI) to provide advanced protection. For both URL categorization and security-focused web reputation, choose between on-premise and cloud lookups, or opt to use a combination of both for optimal protection and performance. Additional protection through McAfee file reputation cloud-based virus lookup capabilities enable Web Gateway to provide greater protection while optimizing security on a single platform. A powerful policy engine enables unmatched flexibility and control in creating and applying policy, supporting the multi-tenancy needs of the largest enterprises and service providers. Web Gateway also extends this flexible control to web applications. Beyond simply allowing or denying access, Web Gateway provides granular function control within nearly 1,000 web applications, including popular social and streaming media, file sharing, and anonymizing applications. Keep confidential information from leaking out of your organization by scanning user-generated content on all key web protocols. Have advanced data loss needs? Rely on Web Gateway to integrate with McAfee Data Loss Prevention (DLP) solutions. Close the new backdoor through your security barrier with fully integrated malware detection, SSL inspection, and certificate validation directly on the Web Gateway appliance. Identify your organization’s usage trends, isolate problems, document inappropriate web activity, and comply with regulations with powerful reporting capabilities and integration with the McAfee ePolicy Orchestrator (ePO) platform. Use this information to tailor filtering settings to best enforce your web-usage policies. As web application use and sophistication increase, so does the need for flexible access coupled with advanced web security because even seemingly “safe” sites can be targeted for malware distribution. In today’s world, simply blocking known viruses from downloading or restricting access to “known bad” websites is not enough. Reactive techniques, such as signature-based antivirus and category only URL filtering, were never designed to enable Web 2.0 access or combat today’s exploits. The simple blocking approach offered by these solutions means entire pages or even domains can be blocked rather than the specific malicious code or object, hindering productivity while generating helpdesk calls. And since these solutions focus on known content and malicious objects or executables, they can’t prevent today’s attacks that hide malicious code within seemingly good HTTP or HTTPS traffic or provide protection against unknown or emerging threats. The ability to enable secure, granular access to Web 2.0 applications while proactively blocking unknown, as well as known, threats is now crucial. McAfee understands the security needs of the web-enabled world like no other vendor and offers the industry’s most effective, proven proactive solution: McAfee Web Gateway. McAfee Web Gateway delivers comprehensive security for all aspects of web traffic, regardless of location or device. For user-initiated web requests, McAfee Web Gateway first enforces an organization’s Internet use policy. For all allowed traffic, it then uses local and global techniques to analyze the nature and intent of all content and active code entering the network via the requested web pages, providing immediate protection against malware and other hidden threats. And, unlike basic packet inspection techniques, McAfee Web Gateway can even examine SSL traffic to provide in-depth protection against malicious code that has been disguised through encryption. Inbound protection also mitigates risks for organizations hosting websites that accept data or document uploads from external sources. McAfee Web Gateway in reverse proxy mode scans all content before it is uploaded, securing both the server and the content. To secure outbound traffic, McAfee Web Gateway scans user-generated content on all key web protocols—including HTTP, HTTPS, and FTP—and protects against loss of confidential information and other threats leaking from the organization through social networking sites, blogs, wikis, and even online productivity tools such as organizers and calendars. McAfee Web Gateway also safeguards against unauthorized data leaving the organization through “bot-infected” machines attempting to phone home or transmit sensitive data. As the number one-rated malware protection,* McAfee Web Gateway uses a patent-pending approach to signature-less intent analysis with the McAfee Gateway Anti-Malware Engine. Proactive intent analysis filters out malicious content from web traffic in real time. By scanning a web page’s active content, emulating and understanding its behavior, and predicting its intent, McAfee Web Gateway proactively protects against zero-day and targeted attacks as they occur. McAfee Web Gateway now integrates with McAfee Advanced Threat Defense—advanced anti-malware detection technology, with innovative sandbox capabilities that combine static and dynamic analysis. The result is greater accuracy and stronger protection against advanced, dynamic malware threats. McAfee combines this local, real-time intent analysis with comprehensive McAfee antivirus protection to quickly block known viruses and several cloud-based technologies—all powered by McAfee Labs. Use of multiple technologies enables McAfee Web Gateway to provide greater protection while optimizing security on a single platform with different, yet complementary, technologies—something many organizations want for their defense-in-depth security approaches. McAfee antivirus with real-time McAfee Global Threat Intelligence (McAfee GTI) file reputation—With cloud-based McAfee GTI file reputation look-up capabilities, McAfee closes the gap between virus discovery and system update/protection. McAfee GTI web reputation and web categorization—McAfee Web Gateway delivers enhanced web filtering functionality and protection through the powerful combination of both reputation and category-based filtering. McAfee GTI powers McAfee Web Gateway’s web filtering technologies. McAfee GTI creates a profile of all Internet entities—websites, email, and IP addresses—based on hundreds of different attributes gathered from the massive, global data collection capabilities of McAfee Labs. It then assigns a reputation score based on the security risk posed, enabling administrators to apply very granular rules about what to permit or deny. different attributes gathered from the massive, global data collection capabilities of McAfee Labs. It then assigns a reputation score based on the security risk posed, enabling administrators to apply very granular rules about what to permit or deny. Sophisticated cybercriminals have turned to SSL traffic (HTTPS) as the new back door through the enterprise’s security barrier. Ironically, a protocol designed to provide security must now also be secured against abuse, just as traditional HTTP traffic must be secured. McAfee Web Gateway is the first security product that fully integrates malware detection, SSL inspection, and certificate validation. There’s no need to route encrypted traffic to a separate box for malware inspection. McAfee Web Gateway directly scans all SSL traffic to ensure the complete security, integrity, and privacy of encrypted transactions. McAfee Web Gateway protects organizations from outbound threats—such as leakage of confidential information—by scanning outbound content over all key web protocols, including SSL. This makes it an essential tool for preventing intellectual property loss, ensuring and documenting regulatory compliance, and providing forensic data in the event of a breach. Now integrated with the McAfee Data Loss Prevention (DLP) solution, McAfee Web Gateway supports predefined DLP dictionaries and enables custom dictionaries to be created through keyword matching and/or regular expressions. As the workforce becomes more distributed and mobile, the need for web filtering and protection to seamlessly transition from the office to the road becomes increasingly important. With McAfee Client Proxy, a tamperproof client agent enables roaming users to seamlessly authenticate and redirect to a McAfee Web Protection solution, either Security-as-a-Service (SaaS) or our onpremises web gateway. This enables Internet access policy enforcement and full security scanning to be applied to roaming users, even if their Internet access is being provided through a captive portal, such as at a coffee shop, hotel, or other Wi-Fi hotspot. McAfee Web Gateway also allows enterprises to extend and enforce their security policies on mobile devices. Today’s popular smartphones and tablets, including BlackBerry, Apple iPhone, Apple iPad, and Google Android, can direct web traffic to McAfee Web Gateway which, through standard device management and security controls, ensures that mobile devices are secured with advanced anti-malware protection and corporate web filtering policies. McAfee Web Gateway also extends protection to mobile devices accessing content that is traditionally available on internal corporate servers such as intranets, wikis, Microsoft SharePoint servers, and other webbased solutions. While this information is generally not made available to certain mobile devices due to security concerns, McAfee Web Gateway setup as a reverse proxy can enable controlled and secure access to these internal resources. McAfee Web Gateway enables today’s web-centric enterprises with a powerful rules-based engine for optimal policy flexibility and control. To streamline policy creation, McAfee Web Gateway offers an extensive pre-built rules library with common policy actions. Organizations can pick and choose various rules, easily modify these rules, and share their own rules through an online community. The McAfee Web Gateway platform extends policy flexibility and control to web applications as well, enabling granular, proxy-based control over how web applications are used. Organizations can choose from nearly 1,000 popular web applications, enabling or disabling specific functionality as needed, controlling who uses a web application and how it is used. Do you want to enable access to Facebook but not allow games? No problem. The combination of flexible policy creation, advanced anti-malware scanning, and web reputation also means that McAfee Web Gateway can remove malicious links (based on reputation or category) from a web page or extract only the malicious code while letting the balance of the page display—fully optimizing productivity and granular Web 2.0 security. Web gateway flexibility and control also extends to user authentication and access. McAfee Web Gateway supports numerous authentication methods, including NTLM, RADIUS, AD/LDAP, eDirectory, cookie authentication, Kerberos, or a local user database. The McAfee Web Gateway authentication engine allows administrators to implement flexible rules, including the use of multiple authentication methods. For example, McAfee Web Gateway can try to transparently authenticate a user and, based on the result, prompt the user for credentials, use another authentication method, apply a restrictive policy, or simply deny access. Integration with McAfee Cloud Single Sign On adds the convenience and added security of secure single sign-on for more than 400 popular web applications with user account provisioning/de-provisioning and multifactor authentication. McAfee Web Gateway extends access control to streaming content through native streaming proxy support as well, providing bandwidth savings, and reduced latency. With McAfee Web Gateway flexibility, you can mix deployment options as well. For example, you can offload portions of web traffic to the cloud during peak times for added high-availability performance or use this hybrid model as a cost-effective fail-over option. Common policies and reporting for hybrid on-premises and cloud deployments help streamline management, ensure consistent policy enforcement, and simplify reporting, tracking, and investigation. McAfee Web Gateway offers numerous implementation options—from explicit proxy to transparent bridge and router modes—to ensure that your network architecture is supported. With support for numerous integration standards, McAfee Web Gateway is designed to work in your unique environment. From the web cache communication protocol (WCCP) to the Internet content adaptation protocol (ICAP/ICAPS), McAfee Web Gateway efficiently communicates with other network devices and security appliances. Additionally, McAfee Web Gateway now offers IPv6 support, helping larger organizations and federal institutions comply with regulations. McAfee Web Gateway bridges the gap between internal IPv4 and external IPv6 networks and applies all available security and infrastructure features and functions to the traffic. The most popular and respected security management technology, the McAfee ePolicy Orchestrator® (McAfee ePO™) platform, is supported by McAfee Web Gateway. As the single source for consolidated information, the McAfee ePO platform helps you quickly identify and mitigate problems and improve compliance management. McAfee ePO software supports detailed web reporting through the McAfee Content Security Reporter extension. McAfee Content Security Reporter gives you the information and forensic tools you need to understand how your organization is using the web, comply with regulations, identify trends, isolate problems, document inappropriate web activity, and tailor your filtering settings to enforce your web usage policies. It combines dashboard views and drilldowns into web traffic with powerful offline processing—everything you need in one easy-to-use solution. McAfee Content Security Reporter offers an external, stand-alone report server designed to offload resource-intensive data processing and storage from the existing McAfee ePO server, enabling it to scale to meet the reporting needs of even the largest global corporations. For the ultimate in deployment flexibility and to help future-proof your investment, McAfee offers all features of the McAfee Web Gateway and McAfee SaaS Web Protection Service in a single suite: McAfee Web Protection. Deploy on premises, in the cloud, or both for added deployment flexibility and high availability—the choice is yours. You’ll find award-winning McAfee anti-malware protection and comprehensive web filtering with either option. McAfee Web Gateway hardware is sold separately. * In recent tests conducted by AV-TEST, McAfee Web Gateway detected 94.5% of zero-day malware, 99.8% of malicious Windows 32 portable executable (PE) files, and 98.63% of non-PE files. “McAfee Web Gateway Security Appliance Test,” AV-TEST GmbH. Deployment flexibility is a hallmark of McAfee Web Gateway. You can deploy it as a virtual machine, hardware appliance, or on a blade server. A complete range of enterprise- and medium-capacity appliances offers affordable protection and scalability for the most demanding business environments. Optical Network Card N/A Optical cards are supported as third-party add-ons and must be purchased separately. For compatible modules, reference the product documentation. Optical cards are supported as third-party add-ons and must be purchased separately. For compatible modules, reference the product documentation. Download the McAfee Web Gateway Datasheet (PDF). Download the McAfee Web Gateway Appliance Specifications Datasheet (PDF).